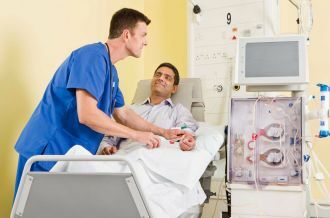 Patients who need a prolonged period of dialysis after receiving a kidney transplant have more post-transplant complications and lower estimated glomerular filtration rate at one year (eGFR)compared with patients who do not, a study has confirmed. An analysis showed that 44% of patients who needed dialysis for more than 14 days post-transplant were still dialysis-dependent at 30 days compared with none of the patients who were on dialysis for a shorter period after transplantation. They also had higher proportions of complications and were more likely to still have a reduced blood filtration rate one year after transplantation. Eighty-three of the patients had delayed graft function, including 52 who were on dialysis for up to one week after transplantation, 13 who were on dialysis for between one and two weeks, and 18 who required more than two weeks of dialysis after the kidney transplant. The three groups had similar ratios of males to females, ages, donor age, type of dialysis, proportion of machine perfusion, and length of cold ischemia time. The length of time on dialysis after transplantation, number of dialysis sessions, and length of hospital stay were all significantly greater in the patients on dialysis for more than two weeks. Their eGFR at 30 days and at one year were also significantly lowerthan those from patients with shorter post-transplant dialysis times. The investigators also found that kidneys from donors after circulatory death (DCD) who had delayed graft function still had reduced eGFRs at one year post-transplant. This study confirms that the more dialysis a patient needs post-transplant, directly correlates with increased resulting complications as compared to individuals who require less dialysis.